Dubai, UAE - April 11, 2019: Al-Futtaim Toyota is welcoming the holy month of Ramadan earlier this year with the launch of new rewards. Customers will no longer have to wait until Ramadan to snag the best deals and can do it a full month earlier with the purchase of their new Toyota vehicle during the month of April. As part of the campaign, customers purchasing a new Toyota will be eligible to get a free Umrah, in keeping with the spirit of the Holy Month. Designed to offer complete peace of mind, the package is inclusive of air tickets, airport meet and greet, private transportation, hotel accommodation and Umrah visa processing. Furthermore, a bilingual help desk service will be operating 24/7 to answer any customer enquiries. Alternatively, customers also have the option to choose a travel destination such as Armenia, Georgia, Istanbul, Sri Lanka, Bali or London. The package is inclusive of air tickets, hotel accommodation, private airport transfers and half day city tour. “Our customers are at the heart of everything we do. 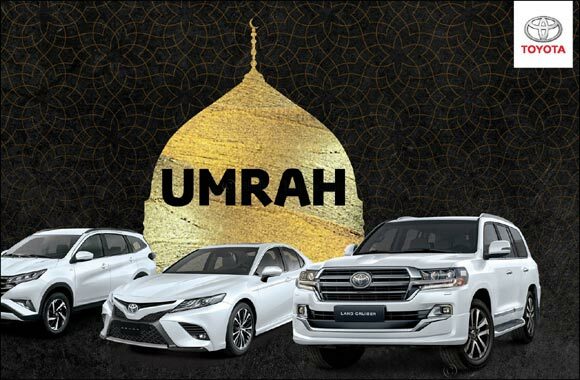 With Ramadan fast approaching we wanted to give our customers the opportunity to experience Umrah or travel to the destination of their choice as part of their new purchase of a Toyota vehicle. Cementing our commitment to ensure that our customers get the best in after-sales service and residual values, but also the most valuable offers from us,” said Saud Abbasi, Managing Director, Al-Futtaim Toyota. From the practical seven-seater Rush SUV to the legendary all-conquering Land Cruiser, Al- Futtaim Toyota has a vehicle to suit the varying needs and lifestyle of its diverse spectrum of customers.